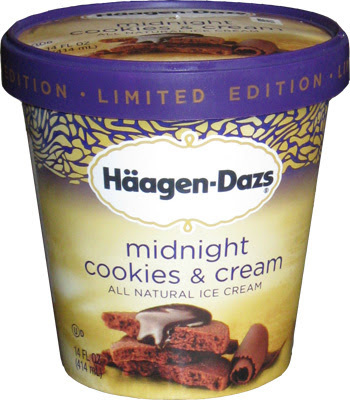 This is Haagen-Dazs "limited edition" midnight cookies & cream and it's artwork has been tormenting me since I first discovered it WAY back in this March 1st post. You might be thinking "hey, if this is limited edition, why is it still out?". Well, I don't have a clue, maybe they were waiting for me... but probably not. My apologies for not getting it on the blog sooner since I would always see it at lunch but when I went to buy it on the way home, all I would ever see is limited edition dark chocolate mint. Enough background, let's see this flavor in action. The description is "smooth, chocolate ice cream seduced by buttery fudge and chocolate cookie wafers make for a perfect midnight, or anytime treat." I guess I expected ribbons of fudge and a few more cookies, but this is H-D, so they do tend to be... shall we say "precise" with their inclusions. Let's dig in. I take my first bite and.... wow, wait, what? coconut? I thought this was going to be some dark chocolate cookies and cream type flavor. It's only been one bite but I quick check the ingredients and sure enough we've got coconut in the "swirl" and the cookies (I aimed for a cookie on my first scoop, why would I aim at anything else?). I took several more bites and found the coconut flavor coming and going. This is so weird and totally not what I expected. The problem is that when there is no mention of coconut, you really start to question your own tasting abilities. Am I imagining things? Did I get a wacky container? I just don't know for sure. Actually, I could go do a second scoop and make sure, but it's too late for that, maybe tomorrow! Stay tuned! On Second Scoop: It's days like today that I wish I had the refined palate to accurately describe the complexity of the chocolate flavor in this pint. Yes, there is coconut, but it's more complex than that and I lack the skills to describe it. I can't even think of something it reminds me of. 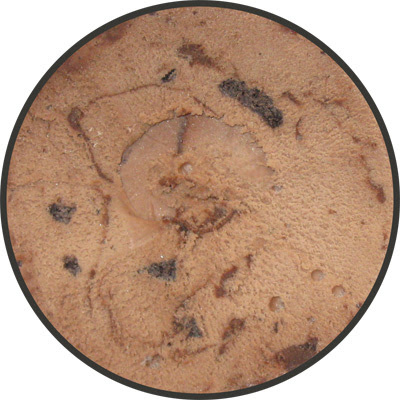 The buttery fudge and gritty cookie bits combine for this textured flavor that is present, but not in your face. Basically, it's a typical, refined H-D flavor you expect from them. H-D just doesn't do crazy. Note #2: I seem to be the only crazy person picking up on the coconut, really starting to question my taste testing skills here... I'm almost tempted to buy another pint... Or maybe I've just subconsciously worsened my grudge with coconut. Update: For 2013, this flavor has gone from a widely distributed limited pint to an exclusive (only some stores) flavor. Who knows where it will show up. When I tried this I didn't get much in terms of coconut flavor. It would not have mattered though as I'm a coconut fan. I really liked this one, I'll probably grab another before the limited edition period is over. it's a few days later and I'm still trying to think of a better way to describe the underlying flavor... oh well, go with first impressions I guess! I bought this for the first time a week and a half ago. I'm in LOVE!! I had some two days ago too. *ashamed smiley* I didn't taste the coconut flavor either and since I HATE coconut, I would have tasted it has it been really prevalent. I will be taking full advantage (and gain 50 more pounds that I don't at all need) during the limited edition. Rest assured though you and your taste buds are not going insane! 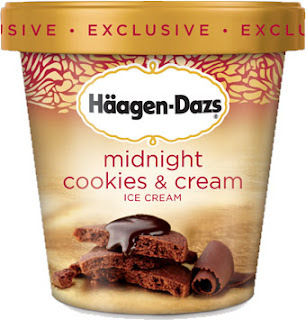 According to the ingredient list on the Haagen-Dazs website there is coconut oil listed as an ingredient in both the fudge swirl (and we all know how I feel about the use of "fudge" over actual chocolate) and in the cookie pieces. I personally can always taste coconut in Haagen-Dazs flavors that have cookie pieces. i feel a little less insane now! This was easily my favorite new grocery store ice cream of the year. I mourn the loss of many Haggen-Dazs chocolate flavors (Mayan Chocolate, Triple Chocolate, Belgian Chocolate) but found this to be in step with the ones that got away. Like you, however, I found it very difficult to find a store that carried it. Wish I'd bought up the store when I had the chance. I didn't taste coconut so much as I tasted the brown sugar. It harmonized well with the richness of the chocolate. I shall have to try using it in my own recipes. I don't understand how this is still a "limited edition" if it's been in production for over 3years. Stride, it started out as a limited edition but then turned into a walgreens exclusive. Now it is once again a limited edition that's available everywhere. I feel lie Haagen-Dazs called in their limited editions this year. They returned two of last years flavors and turned two other normally produced flavors into limited editions. I have been waiting for this ice cream to come back. I distinctively remember having it all thr time in 1996. It then disappeared. I'm hoping it's as good today as it was 20 years agp!